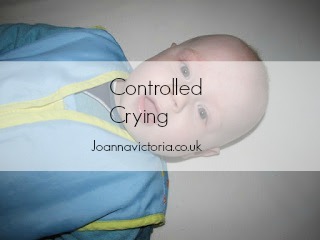 Today I am writing a very controversial topic about Controlled Crying. I recently came across a video on Channel Mum about Controlled Crying and wanted to give my opinion on the topic. There are a couple of things I wanted to mention, first being I won't be allowing any negative and "bullying" comments on this post so they won't be published. You are however welcome to give your own opinion as long as you aren't "bullying" others on their opinions (including mine). I would also like to mention that controlled crying is completely different from Crying it out. Crying it out is leaving your baby to cry without going to see them until they eventually fall asleep. This is something we would never do and something we don't agree on. Controlled crying is basically letting your child cry for a set period of time and then going in seeing to them and comforting them. You then gradually increase the periods of time before being comforted until they fall asleep. This is something we have done with Blake. Blake in general is a good sleeper and has been from 6 weeks old. Controlled Crying shouldn't be done under the age of 6 months by the way as at that age they will generally need something. Although Blake is a good sleeper there have been a few occasions when he wakes in the night. We do go and see to him and make sure he isn't ill or hungry (if I know he hasn't eaten much during the day) or has wet through. If its none of these things which is very rare than it is usually him wanting attention but if after a cuddle he is still upset than we will do controlled crying. Now when it comes to controlled crying most times that we have done it Blake has stopped after 10 minutes and gone to sleep. I know this is going to have mixed views and opinions on this but Blake is such a happy and cheeky little boy and he is much less grumpy if he has had a good nights sleep. This is something that has just worked for us and I'd do it again with the next child too and see if it works but if it don't then I'm not going to force it. Have you tried controlled crying? Do share your experiences in the comments below. We did controlled crying with both of ours at five minute intervals. I remember the first time we did it we were amazed. The baby hadn't been settling for weeks. We did CC and by the second check she'd crashed. From then on it only took two or three checks. I'm not a believer in CIO though. That seems a bit harsh. Yes I think as parents we do what we feel comfortable with. Definitely cryjng it out is a no no in my books. Controlled j feel us much better than crying obit out as ur child knows he there for them still. I never did controlled crying but hands up - I did leave him to cry it out. I had a baby that cried non-stop for 12 hours a day until he was 18 months old. It was torture. I remember phoning my HV when he was about 6 weeks old and telling her I could take no more. She asked me where he was, and I told her he was crying in his cot and she basically told me to leave him there and take a break as he was safe there and no harm was going to come to him - no baby died of crying. It was what I needed to hear! Very interesting read. It's a random topic but one that's great to talk about. I hope noone was nasty, controlled crying is an excellent idea especially since it can help them be more independent. Controlled crying has always worked for us, but everyone has their own ways of doing things and I totally respect that it isn't for everyone. I did controlling with all my children and it never hurt them. I never did it before 6 month it was normally about 1 year I would start it. I havn't needed to do it so far, but would definately try it if I needed to. I think it makes perfect sense. Babies & young kids cry when they're tired. What sense does it make to repeatedly go in and keep them awake? I haven't intentionally tried controlled crying but I did allow my son to self soothe at times, times when I knew he was just pining for me for about two minutes and when I'd go into him he'd already be asleep. I thought about trying this when I was at the end of my tether with my daughter but I knew I wouldn't be able to handle it. Every parent has to do what is right for them and their children. A friend tried controlled crying and it turned her into a nervous wreck, which made her of no use to the family the rest of the time. It has never worked for us and going in has only made him more hysterical. We've taken more of a 'know the cry approach'. If it is just a whine/moan we don't go in as it just makes him worse. If he's hysterical we take him out of the room and try to re-set/sooth etc and then start again with putting him down. I would never judge any parent who did this though as you just do what works - I wish it would work for us!! !